Movie stars don't come any cooler than Samuel L. Jackson. He's played a wide variety of memorable roles, and carries a screen presence that demands respect. His newest film, SNAKES ON A PLANE, is reminiscent of cheesy horror and action movies from the 80's... and that's just fine by Sam. In fact he threatened to boycott the film after the studio suggested changing the title to PACIFIC FLIGHT 121. But this film went through more than just title changes. It very quickly gained incredible buzz on the internet. Fans demanded it be R instead of it's intended PG-13, and vehemently requested some more "traditional" Sam Jackson dialogue be added. Strangely enough, the title stayed, and the fans got their wish. While attending San Diego Comic-Con in July of 2006, I had a chance to talk to Sam about the movie, and some of his other work. Here is what he had to say. MARK: The thing I don't understand is why Hollywood would be opposed to it. When you go into a room to make a pitch, it's always that one-line pitch. Why not just give that to the movie audience as well, and say this is what the movie is about? MARK: So do you like doing horror movies? SAM: Yeah man. I'm gonna do another one Sunday, called SECTION 8. It's a Stephen King short story, in London. MARK: Oh that's great! Are you a Stephen King fan? SAM: Yeah, absolutely. I guess it's good if they're going to make a movie out of it. But hopefully it won't be a three hour movie, just a good short story movie. Keep it short, keep it scary. 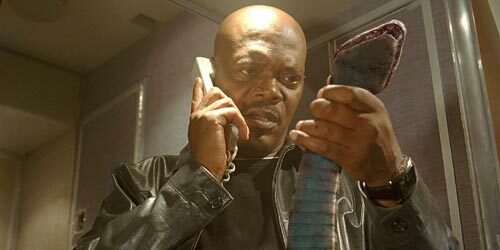 MARK: How much input were you given during SNAKES ON A PLANE, like creative input? Were you ever able to go in and say "Here's some ideas" or something to punch up the scenes a little bit? SAM: Yeah, but those are things we couldn't put in the movie! Hah-ha! MARK: Kenan was saying he did a lot of improv. SAM: Yeah he did, we had to choke him for that, and say SHUT UP! MARK: "Yeah, we know you're funny!" ...that kind of thing? SAM: They didn't see where we were trying to go with it. They always think they're smarter than us. I've done like almost 100 films now, but most of those people have had their job for like a year and half. Maybe they've done two films. MARK: Hollywood has really changed. It's not a lot of older guys running it. It's young guys now. MARK: They don't know the business. SAM: And they're not... they're not audience friendly, let me put it that way. SAM: I did a movie like this because it's the kind of movie I'd go to see on a Saturday afternoon with my friends. And we couldn't wait for it to come out so we could go and yell at the screen, and reach around and touch somebody on the neck and they'd go AHHHH! I find myself a lot of times reading scripts and remembering a particular movie I saw when I was a kid. So that reminds me of it, and I thought "I need to do something like this" because I remember how much fun I had going to see it. A lot of times movies were let's leave home on a Saturday afternoon and sit at the movies all day, cause that's when they didn't put you out. You'd just stay there all day long. I'd be at the movies and watch a movie three times. That's the kind of movie I want to do sometimes. Something that's entertaining and fun, and somebody's afternoon escapism. And then there's the great story that comes along that you want to tell, and it's fun and fine to do as an actor, to stretch yourself and to give yourself a challenge as an actor. There's no plan for a big studio movie here or an independent movie here, because movies are ready to go when they're ready to go. So if the independent movie is ready to go I jump into it, and if the big studio movie is ready to go I jump into that. I just did a small film in Calgary, RESURRECTING THE CHAMP, going to do this film for the Weinsteins called 1408, and after that I'm doing kind of a big studio sci-fi movie called JUMPER. SAM: Yeah, I'm looking forward to seeing if Nick Fury is actually gonna stay black when they get ready to make a movie. I see Avi Arad a lot because we live in the same neighborhood, and I kind of expressed my interest in... I always wanted to be Iron Man. Because he's kind of a rich dude, who created this stuff. He's not really kept as a superhero, he just creates stuff to make himself a superhero. But Nick Fury would be great. I've been reading Nick Fury since THE HOWLING COMMANDOS. I collect comics. I'm just like all these other people. I collect a lot of different comics books, I read comics, I'm in Golden Apple (huge comic shop in L.A.) twice a month. I collect comics on film, kind of geeky about that too. I collect Anime, kind of geeky about that too. (remember, we're at the world's largest comic book show) I cannot go down there man! It's like being in a crack house with no money! SAM: Exactly, that'd be the only way! Or a Jedi costume. MARK: They'd be saying "Man you really look like Samuel L. Jackson." SAM: A LOT like him "Damn, where'd you get that mask?" But as for comics, the only thing I have that might be valuable... I have the original LONE WOLF AND CUB set, from #1 to like #47. MARK: So you're serious about this. That's good. What do you think was the best comic book movie ever made? SAM: Best comic book movie ever made... hmmm. MARK: Or do you think we've not seen it yet? SAM: You know I'd have to go back to like THE CROW. SAM: Yeah. I remember when I first read it several years ago, I thought "this would make a great movie." It's too bad that kid died. MARK: I know, it's such a shame, but a great film. SAM: Last thing I read was the newest 100 BULLETS. MARK: You know I have to ask, since you know Avi, and you're such a great comic fan, have you had any aspirations to maybe write some comics and get involved in the comic book industry? SAM: No. Too much work! MARK: No ideas for characters? SAM: Nah, I need to work. SAM: She's got a lot of time on her hands, I work a lot (we laugh) I work a bit more, how 'bout that? MARK: So I can't talk you into starting your own comic book series then? MARK: How do you fathom that? SAM: You don't. I remember sitting in the movies and watching STAR WARS for the first time and thinking "Wow, how do you get something like this?" ...having no idea, just because I was a young actor in New York, doing theater. It's a long way from there to the movies. And then eventually I reached a place, in a setting like this but on a television show, and they were saying "Are there any directors you haven't worked with before that you'd like to work with?" and I was like "Uh, yeah, George Lucas, they're filming Star Wars and I'd really love to be in that." Then somebody said to George Lucas "There's this kid Sam Jackson that really wants to be in your movie." Yeah, right. Then going to the ranch and meeting George, and saying "Yeah, I'll be a stormtrooper, I don't care. I'll put on that white helmet and run across the stage. As long as I know I'm in it, I don't care if anybody else knows." SAM: And they said "We'll do better than that, don't worry about it." ... not really knowing what I was going to do. When I got there for Episode I, I hadn't seen the script, hadn't seen any pages. They just said come to London, and I went to London. They said "You have a costume fitting today." I went in for a costume fitting, and I walked into the dressing room, and there were some Jedi robes in there. I was like "What? This is mine? This is me? This is me?! I'm a Jedi?!?! GET OUT OF HERE!!!" It was like the biggest smile in the world. And you know, to end up the way my character ended up and being as important as it was is like a real blessing. And George was great about it. Like he said, he didn't know how I was going to fit into all of this, but I showed up... I did the thing I usually do. I showed up, I stayed out of the way, I learned my lines, when he needed me I hit my spots, and I didn't complain about not having anything to do. I had more and more to do as time went on, and it paid off. MARK: It definitely paid off in the end. Find out more about Samuel L. Jackson HERE.